Craft distilling is a relatively recent phenomenon in Washington. In fact, before the laws changed in 2009, there was no distilling industry in Washington. Of course, craft brewing is nothing new and some of our local breweries have been around for 20 and even 30 years. For example, Maritime Pacific Brewing fired up the brew kettle for the first time in 1990. 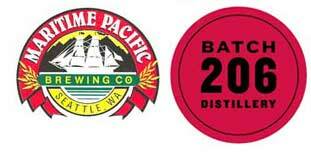 T oday we share news of a collaboration project involving one of Washington’s oldest, most-beloved breweries and one of these newfangled craft distilleries: Maritime Pacific Brewing and Batch 206 Distillery. 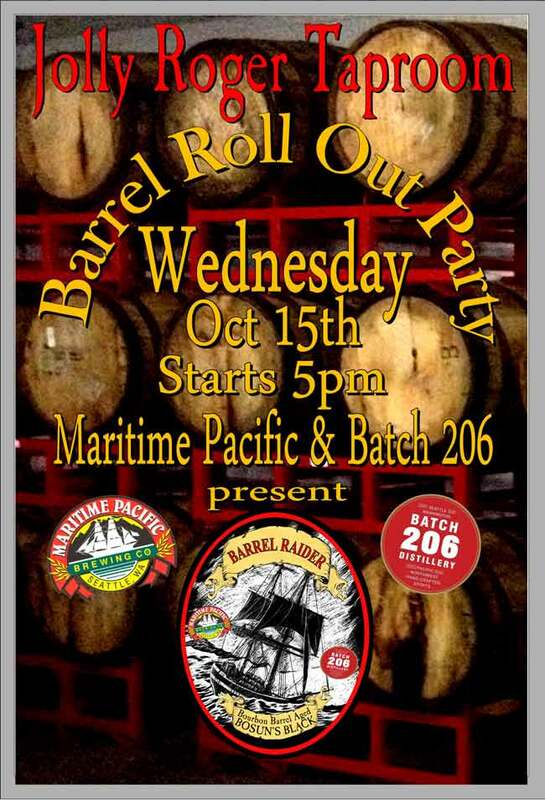 This Wednesday, October 15, Maritime Pacific releases Barrel Raider Bosun’s Black Porter at the Jolly Roger Taproom in Ballard. The beer will only be available at the taproom and at select accounts. The beer, Maritime’s Bosuns Black Porter, was aged for nine months, spending three of those months in Batch 206 Barrel Raider Bourbon barrels. Below is the press release we received from Batch 206. We’ve also talked to the brewery about the project and the beer. Maritime Pacific is excited about this collaborative effort, thrilled with how the beer turned out, and is now eager to share the spoils with local beer lovers. 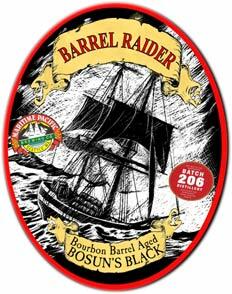 Seattle, October 8, 2014: Batch 206 Distillery and Maritime Pacific Brewery, one of Seattle’s original Breweries, have partnered for the upcoming limited release of “Barrel Raider Bosun’s Black Porter”. Maritime Pacific will release this bourbon barrel aged beer at the Jolly Roger Taproom in Ballard on October 15th. This special release will only be available at the tap room and in select bar and restaurant accounts. For this limited release, Maritime Pacific aged their delicious “Bosun’s Black Porter” for over 9 months with 3 of those months aged in freshly emptied, Batch 206 Barrel Raider Bourbon American oak barrels. The result is a Dark, Roasty, Beer forward, no nonsense Porter with hints of oak and bourbon in the finish. Bosun’s Black Porter is one of Maritimes original beers which has since become a much sought after seasonal brew because of its now limited availability. Bosun’s Black is a rich blend of NW malted barley and wheat, along with a hop backbone of Goldings and Fuggle hops. Batch 206’s Barrel Raider Bourbon is a 7 year aged, high rye Bourbon, bottled and released by Batch 206 Distillery in the last year. Maritime Pacific and The Jolly Roger Taproom, located near Historic Ballard, is a small, family-owned brewery featuring hearty fare as well as world-class ales and lagers. The 40 barrel brewhouse produces over 7,800 barrels per year for its taproom and for distribution throughout the Puget Sound and Eastern Washington area. The Jolly Roger Taproom features twelve(12) different Maritime beers at all times with two (2) cask conditioned ales on the beer engines. Happy Hour runs from 3 to 6 pm M-F, with a great discounted food menu and $3 pints. The Taproom is located at 1111 NW Ballard Way, is kid friendly, and its hours are: Monday through Wednesday from 11:00 to 10:00; Thursday from 11:00 to 11:00; Friday and Saturday from 11:00 to Midnight; and Sunday from Noon to 9.